Stem and root rot of stevia is caused by the fungus Athelia rolfsii (formerly Sclerotium rolfsii). This pathogen is very common and can be found in many fields across North Carolina. The disease is known as white mold or stem rot in peanut production and southern blight on vegetables. A. rolfsii has a host range of over 500 species, but does not attack small grains, corn, and other grass species. A. rolfsii was first identified on stevia in North Carolina in 2012. Symptoms begin with moderate wilting or flagging of stems (Figure 1) similar to symptoms of drought stress. Initial wilt symptoms are followed by rapid necrosis and death of stems. At the soil line, abundant white to brown colored survival structures called sclerotia form at the base of stems. In the morning hours, white cord-like mycelial growth also is frequently observed at the base of stem tissue (Figure 2). Figure 1. Flagging of stevia stems due to infection by A. rolfsii. Figure 2. Field symptoms of stem rot on stevia: (A) Multiple plants exhibiting wilting and plant death (B) Close up of wilting and necrosis caused by stem rot (C) Abundant sclerotia production at the base of stems (D) Characteristic hyphae of A. rolfsii. 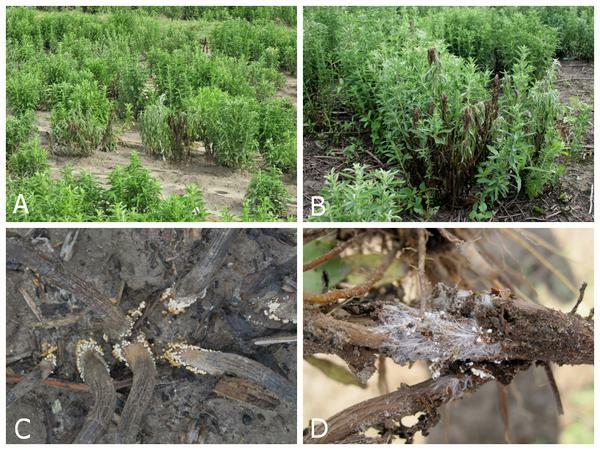 In fields with a history of A. rolfsii, sclerotia overwinter in the soil and can infect stevia immediately following planting and remain active throughout the entire growing season. Sclerotia are able to germinate on the roots (Figure 3) or stems (Figure 4) of stevia plants. As plants are infected, new sclerotia form (Figure 4) and remain in the soil to infect plants and potentially move through the field via equipment. This disease is active from planting in April or May until harvest in August or September. Symptoms can develop rapidly with entire plants dying within a week following initial infection. In perennial production, inoculum loads can build and large areas of symptomatic plants may be observed (Figure 5). Figure 3. Sclerotia germinating on root ball of a stevia transplant. Figure 4. A. rolfsii infecting the stem of a stevia transplant. Figure 5. Field with a history of A. rolfsii showing a large patch of symptomatic plants in a 1 month old stevia field. No resistant germplasm has been identified at this time. Rotating with corn, small grains, and other non-host grass species may help to reduce inoculum in the soil. Stevia is a new crop and does not have any products labeled for management of stem rot of stevia. 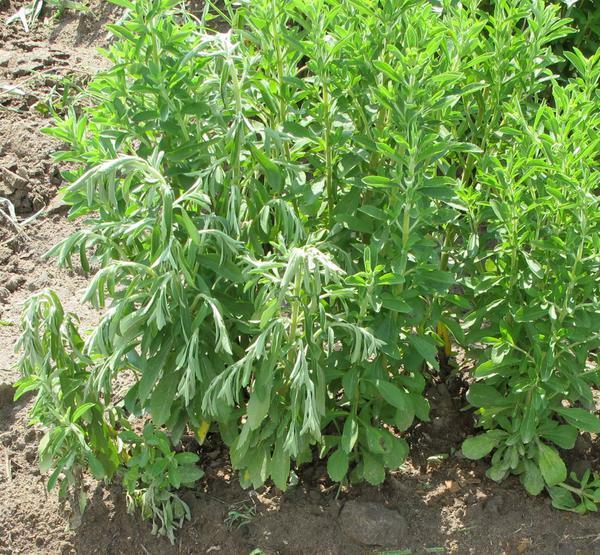 Efficacy field trials have been conducted to assist in establishing labels for A. rolfsii control in stevia production. Aycock, R. 1966. Stem rot and other diseases caused by Sclerotium rolfsii. N.C. Agr. Expt. St. Tech. Bul. No. 174. Koehler A.M. and Shew H.D. 2014. 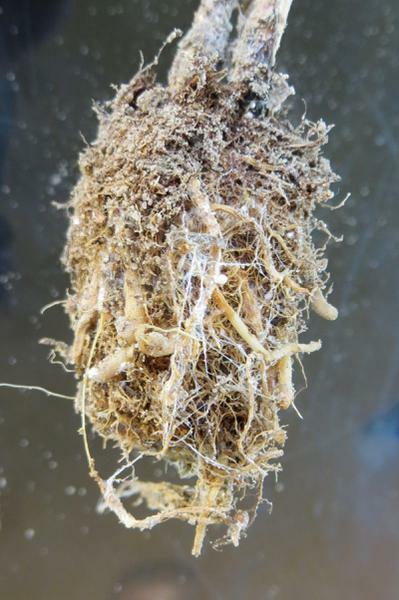 First report of stem and root rot of stevia caused by Sclerotium rolfsii in North Carolina. Plant Dis. 98:1005. Koehler A.M. and Shew H.D. 2015. Evaluation of Abound, Convoy, and Folicur for stem rot control on stevia in North Carolina, 2014. Plant Dis. Manag. Rep. 9:V102. Online publication. doi: 10.1094/PDMR09. Koehler A.M. and Shew H.D. 2017. Evaluation of Veramin Quality and Serenade Opti for stem rot control on stevia in North Carolina, 2014-16. Plant Dis. Manag. Rep. 11:V007. Online publication. doi: 10.1094/PDMR11. Koehler A.M. and Shew H.D. 2017. Enhanced overwintering survival of stevia by QoI fungicides used for management of Sclerotium rolfsii. Plant Dis. 101:1417-1421.